I thought the fair was disorgainized. People were cutting lines everywhere. I was not told that you needed tickets for food. It would have been helpful if this was mentioned on the website before hand. All of the events on the stage caused a mass group to form in the middle of the festival causing major traffic problems. A lot of people could not see the stage because of such crowding espciallly small kids. Had a great time! The staff members at each booth were more than welcoming and polite. It was a great chance to experience a tiny bit of Japanese culture before actually going to the country next year! Hope that next year would be in a more bigger location.... loved the mochi and the grilled tonketsu.. I really enjoyed the fair. It was a lot of fun to see all the Japanese themed booths and i will definitely come back next year. I think there were problems because it was a first time. It was very crowded and the organization of the booths wasn't planned well enough. 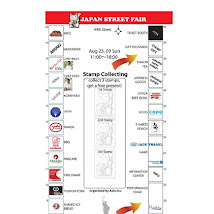 But bringing together of all the Japanese oriented booths really was exciting and the sellers were very nice. 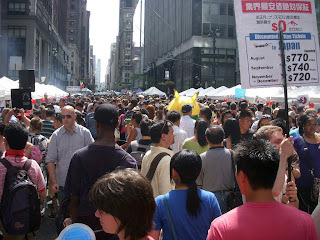 I have never been to japan but i have heard quite a lot Japanese summer fairs. i really felt bringing all the different things together like this was almost like visiting japan on NYC streets. It was a great festival for the Japanese section but way too small for the crowds. It is nobody's fault of course that the Japanese section was the most popular but it was disappointing because you couldn't move to enjoy anything. I was there between 2 and 3 and really wanted to taste some food but it was impossible. Next year try to get another street block and then separate food from products/crafts/music in next block. Also maybe make a small platform area for performers to rise above crowds. Even stepping on two feet off the street level would have made them visible. Unless you are tall you could not see entertainment people if you did not get in first two rows. It has a lot of potential to be a fantastic thing but it was impossible during peak hours for most people to enjoy it like a street festival should be because of large crowds. I had plenty of other delicious ethnic food but had no Japanese food because of the lines/crowding. And the Japanese food is the reason I went to see the festival. Ideally, Japanese should get a park or maybe Hudson River and do Japan only festival. I think it would be very very popular thing and easier to make it in a park or along river like a riverfest. I have no complaints about Japanese set up just that it should be more spread out and food needs to be separated from other stuff. It was a great showing by the Japanese section so they can be happy about that but hopefully next year they can expand to make it more enjoyable to walk then see/taste/listen. Good job and congratulations overall. I don't want to sound negative just trying to suggest for the future. It was difficult to navigate due to the crowds, however those that had the patience to stand in line appeared to have a good time. Maybe next year you can have a bigger space so that it can accommodate a bigger crowd. المجالس العربية لا غنى عنها في المملكة العربية السعودية والدول الخليجية ويستخدمها أفراد الأسرة بشكل مستمر، لذلك هي عرضة للأوساخ والجراثيم ونحن نقدم لكم عمالة متخصصة في تنظيف المجالس بأفضل الماكينات الحديثة. الموكيت من أكثر أنواع الأغطية الأرضية التي يعتمد عليها حالياً وتتعرض للبقع والأوساخ لذلك قمنا بتوفير أفضل ماكينات البخار مع عمالة مدربة على كل طر رق التنظيف للتخلص من البقع والاتساخات بجودة ودقة عالية.